Home Law Enforcement Your tax dollars, working for you…..
Oak Park— The old adage says you can’t fight city hall. But the case against the woman who planted a vegetable garden in her front yard suggests maybe you can. City Prosecutor Eugene Lumberg said he dropped the misdemeanor citation against Bass for growing cucumbers, tomatoes and other vegetables in raised beds in her front yard. “I want to look at it, I want to see the facts, I want to see where this vegetable garden is going and make a determination of whether or not to prosecute under the existing ordinance, write a new ordinance and (examine) the public welfare,” Lumberg said. Asked if that meant this case could be resurrected, Lumberg said he couldn’t predict what would happen. But Bass’ attorney, Solomon Radner, suspects the charge for the vegetable garden was dropped because Oak Park wants to get out of the international spotlight. Last week, Bass’ plight went viral, and city officials acknowledged they were barraged with emails and even threatening phone calls as the suburban mother and gardener faced a $100 fine and up to 93 days in jail. But Lumberg said that’s ridiculous. “I made a decision not to pursue this, and that’s the end of it,” he said. Bass decided to plant the garden in the spring after she and her husband, Jason, had to tear up their front yard to replace an underground pipe. She consulted with city officials in early May to see if they could plant a vegetable garden, but was told no one had ever asked and it appeared to be against the local ordinances. 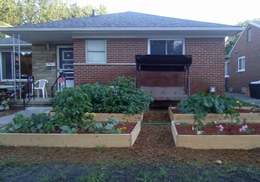 Bass contends the local laws did not explicitly ban vegetable gardens, so she planted the garden in mid-May. Bass’ neighbors complained, city officials said. She was warned in early June and cited about a week later. The story hit the social media, and this week Oak Park dropped the charges. It was only when Radner went to court Thursday to file a motion to dismiss the charges that he learned the charges had been dismissed on Wednesday. Additionally, Bass said, explanation from the city prosecutor makes it sound like the case is not over. There are still disputes over the dog licenses. Unlike the vegetable garden, the couple was never warned about any issues related to the dogs, Bass said. City officials gave them the two dog license citations along with the vegetable garden citation. Bass contends they went to City Hall within days and got licenses for their dogs. When they went to court in late June, they brought the paperwork showing they got the licenses and it was marked in their file. But Lumberg said the paperwork has not been shown. Radner thinks the evolution of the case is simple. “This is really nothing other than a personal vendetta against the Basses, either because somebody doesn’t like them, or because they had the nerve to fight this unjust prosecution,” the attorney said. But Lumberg said Bass broke the law. “There are penalties for breaking the law,” he said. Previous articleNBA money is green too…..